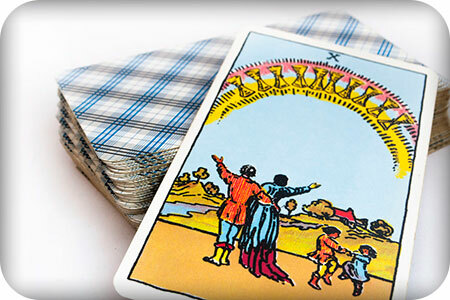 There are 78 cards in traditional Tarot decks and most of them belong to the Minor Arcana. Although they are ‘minor,’ this does not mean they have a weak or minor influence in your life. Instead they address the daily happenings in life. A minor card is often the spark of something that will become, or has become very important, or long-term. For example, some couples are still together decades after a reading reveals a future that begins with the Ace of Cups! The Minor Arcana cards are like regular playing cards, if we add the Court Arcana. They number 1 to 10, and if we add the court cards there is also the Page, Knight, Queen and King. They are divided into four suits: Wands, Cups, Swords, and Pentacles. Each suit corresponds to the four directions, the four elements, and the four seasons. Each of the four suits represents different areas of your life. Wands reveal a person’s actions. They represent our initiative, creativity, invention, and energy. These cards advise and guide us about what actions to take, go over things we did in the past, and advise us what actions to take or not take in the future. Cups represent our emotions, relationships, and intuition. They not only represent people we have feelings for, but also activities, pets, work and hobbies and things that we enjoy, or not. These cards guide us in love and understanding our feelings. Swords are about thoughts and challenges. Many Tarot descriptions about swords say that they are all about problems. But I beg to differ! As a Queen of Swords, myself, I believe swords represent critical thinking. At least when we pull a swords card and it tells us about issues in crisis, we can then allow the cards to guide us about where to direct our thoughts. Remember, thoughts are things! What we think, we can do. Manifestation begins with thought. Swords evoke intelligence. Our thoughts can lead us to do great things, lead us in or out of trouble, and stopping to think can help us solve problems. The swords suits advise us about these options. Pentacles refer to the things we are manifesting on the physical plane. This suit is most associated with work and finances, but also the things we create, or buy. They advise us on our health, money, work and family. When I do a Tarot reading for a person, a combination of Major, Court and Minor Arcana cards will appear. Each reading is completely unique, just as each person and situation is unique. Reading the cards most effectively requires intuition, psychic ability, empathy and knowledge of metaphysics. The Tarot spread will show the reader images of various aspects of a situation that will help guide them in answering your questions.